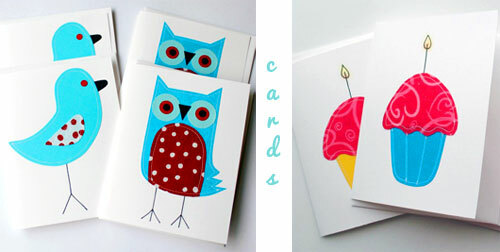 Maybe I'm a sucker for design trends but I really love owls, especially ones that are pink with an eye for fashion. 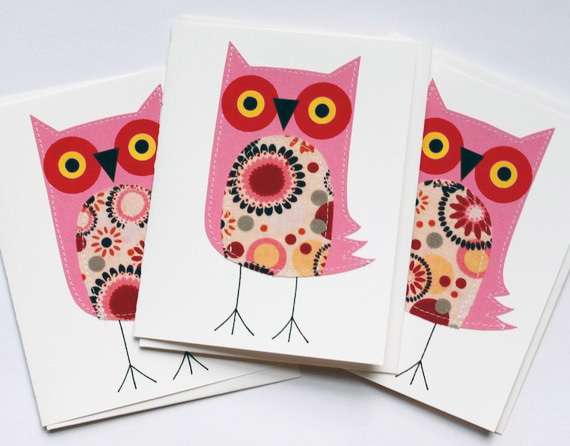 Tammy Lombardi of Tampa, Florida is behind the Polka Dot Shop, an Etsy store of paper goods that exudes sweetness and charm. A crafter at heart, she explains, "I love working with different textures and colors and seeing my finished creation. I get lost in the whole process." When reflecting on her work, Tammy explains, "I like white backgrounds and simple designs." Everything in her shop has some stitching added to it as well- which I must admit is my favorite part. Tammy embraces color. As she tells it, "I want people to be wowed by color when they visit my shop. I try to experiment with combinations all the time." Garlands are an unexpected touch in a room. They always surprise me and make me smile. These lovely options by Tammy are no exception. Thanks Janet of Paintsquare for leading me to the Polka Dot Shop...I think it's safe to say I'm officially a fan.